I am so excited to provide you with FREE PRINTABLES of the words that I used on the To Proficiency... and Beyond! test-taking tip bulletin board so you can make your own! The TO PROFICIENCY... AND BEYOND! 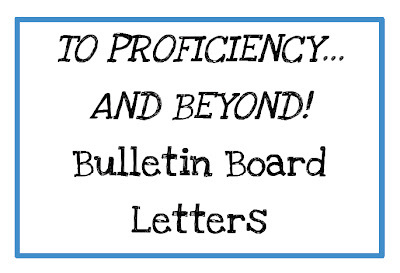 Bulletin Board Letters PDF file contains the letters for "TO PROFICIENCY... AND BEYOND!" for the To Proficiency... and Beyond! bulletin board. The Test-taking tips TO PROFICIENCY... AND BEYOND! 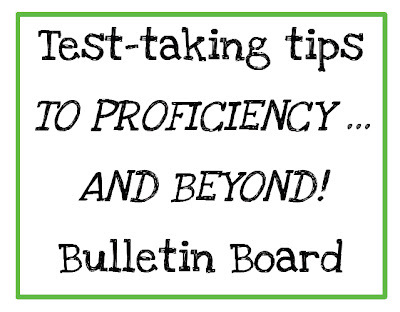 Bulletin Board PDF file contains the test taking tips that we made for on the To Proficiency... and Beyond! bulletin board. I printed all of the words and letters for the bulletin board on AstroBrights card stock and cut them down to the size I wanted with a paper cutter. The font I used to create the bulletin board is Love Ya Like a Sister by Kimberly Geswein. I downloaded the font from the 1001 Free Fonts website, which has amazing FREE fonts! Will you be making a To Proficiency... and Beyond! bulletin board at your school? What do you do to prepare for state testing at your school? posting here!!! Thanks a ton!! !